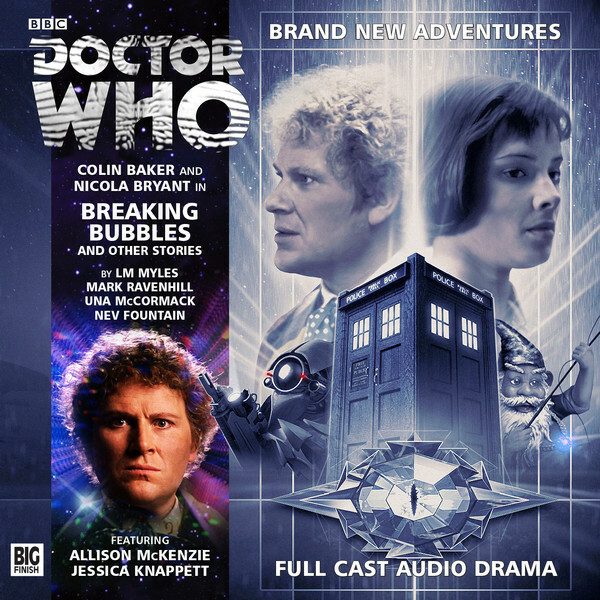 Breaking Bubbles & Other Stories features the Sixth Doctor and Peri in a collection of short adventures. They are Breaking Bubbles by L V Myles; Of Chaos Time, The by Mark Ravenhill; An Eye For Murder by Una McCormack and The Curious Incident of the Doctor in the Night-Time by Nev Fountain. It's a change of structure to the normal Big Finish Main Range. There isn't really a link between the stories except the presence of the Sixth Doctor and Peri obviously, which in this day and age of story arcs is rather refreshing. None of them is quite what you'd expect either. Breaking Bubbles is fun because it starts off as one thing and at the moment I started to think it was going to turn out one way, it turned out another. It features a nice performance from Jemma Churchill as Safira Valtris. I'm skating around this a bit because I don't want to spoil it. It's nicely structured and well-performed. Nothing is quite what you think it is. Of Chaos Time, The is - to borrow a phrase - a timey-wimey twister. The audio equivalent of a tounge-twister. Colin Baker's brilliant here as The Doctor tries to work out what the hell is going on and why. This feels very much like a new Doctor Who story in the Sixth Doctor's clothing. The Curious Incident of the Doctor in the Night-Time is very different to the previous three stories. It's narrated by Michael (Johnny Gibbon) who is - I think - autistic. I've never read or seen The Curious Incident of the Dog in the Night-Time so I've no idea how linked to that book this story is so I have to judge it on it's own merits. I'll admit it took me a little getting used to but in the end I loved it. The story itself features The Doctor and Peri looking for a bad thing. A bad thing that for reasons I refuse to reveal here ends up in Michael's hands. To me though this story is about how a person like Michael, with an interesting way of dealing with the world, copes with loss. There's a lovely scene right at the end when the Doctor talks to Michael about the past, which reminded me a little of the scene between The Second Doctor and Victoria in The Tomb of the Cybermen, but that is rather moving in its own right. **I'm quite serious about the book thing.